I have always had a love (and fetish) for shoes; sneakers, flip flops and boots are my personal favorites. No matter how many pairs I already have, I always love getting new shoes! Lets be honest - what girl doesn't like shoes? My nine year old daughter has already developed a love for new shoes, too! When I was contacted by Sole Provisions to review a pair of their shoes, I jumped at the opportunity - not even thinking twice! I simply couldn't resist choosing a brand new pair of shoes... there was only one problem. How was I going to choose just one pair? After looking around for close to an hour, I finally made my choice. I decided to go with a brand new pair of tennis shoes, perfect for walking on my treadmill and my elliptical. Having a comfortable pair of workout shoes is the difference between a successful workout and a failed one! 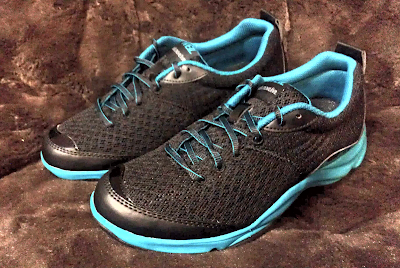 When I received my pair of Weil by Orthaheel: Rhythm Walker black and teal walking shoes I was thrilled! They were even more beautiful in person! All Weil Integrative Footwear styles feature the revolutionary AMS "Aided Motion Control" system, Orthaheel's Tri-Planar Motion Control system, and a first ray flexor zone. These three systems combine to provide easier movement, greater endurance and energy, and improved posture. The Rhythm Walkers are also available in red, coral and silver, white and blue, and dark grey. Of course, beauty isn't the most important aspect of a walking or running shoe - comfort is! When I put them on I could immediately feel the softness and comfort. They were light-weight, comfortable and fit my feet perfectly! Most of the time when I break-in a new pair of shoes, I end up with sore feet, blisters, or both. Not this time! I wore them all day long, did my regular treadmill workout, and ended the day with great feeling feet. Sole Provisions is committed to constantly carrying a great selection of stylish, comfortable footwear from the world's hottest brands, all with free priority 2-3 day shipping and free returns! And as a frugal mom and blogger, I love that they have an amazing shoe clearance section filled with fabulous deals and savings! Everyone loves a great deal, and when you're a Sole Provisions shopper, you know that you'll always find the best prices on seasonal and discontinued models from the world's greatest comfort brands. We are constantly adding new markdowns, so check back to often to make sure you don't miss out on our latest deals! Sole Provisions is also having a great giveaway on Facebook where one of their lucky fans will win a $100 gift card! I LOVE the teal and black together soo cute! I saw them, and I fell in love. Why couldn't I find this pair when I was out shopping for sports shoes? :( They look so comfy and lite. Having foot problems myself, I am thrilled when I find a pair of shoes that are so comfortable that you just don't want to take them off. I love the additional padded sections they add ... and it is right where I have all my problems. I think they made these with my feet in mind. I need to look more into these. I have not been able to find any that I like and I need some for walking. I love how the black and teal look together. I haven't heard of this company before but I am always looking for great shoes that feel good. I have a lot of issues with my feet and joints and need supportive shoes. I love the fact that they have a clearance area. Never heard of them but I like that they are stylish and comfortable!! You are very lucky. It's a quality made footwear. I definitely believe that as you get older, the shoes you wear MUST be helpful for your posture. Otherwise everything starts to fall out of place. These are cute and sounds like it does the job!